Nike Inc.’s decision to feature Colin Kaepernick in its latest “Just Do It” advertising campaign predictably blew up the internet. In one video, Nike shoes were set on fire. John Rich, half of the country music duo Big & Rich, showed that his soundman had cut Nike’s iconic swoosh off his socks. #NikeBoycott quickly began trending on Twitter. At the same time, tennis star Serena Williams tweeted that she was “especially proud to be a part of the Nike family today.” Others said their children planned to wear Nike from head to toe in support of Kaepernick. None of that should have been a surprise _ least of all to Nike. The athletic shoe and apparel company took a calculated risk in featuring Kaepernick, the former San Francisco 49er quarterback who is now far better known for kneeling during the pregame national anthem to protest police shootings of black men, marketing experts said. Though the move was sure to be seen by many as provocative, the Beaverton, Ore., company is betting that more customers will support it _ particularly the younger demographic that Nike is courting. Nike isn’t the only apparel brand fighting for younger consumers. Baltimore-based Under Armour Inc. also caters to a younger demographic and has signed a number of elite athletes, including Golden State Warriors point guard Steph Curry and Misty Copeland, the first African American female principal dancer with the American Ballet Theatre. Nike reportedly had competition for Kaepernick _ Yahoo Sports reported Monday that Adidas and Puma were among “multiple” brands that had talked about signing him if Nike did not renew his sponsorship deal, which began in 2011. 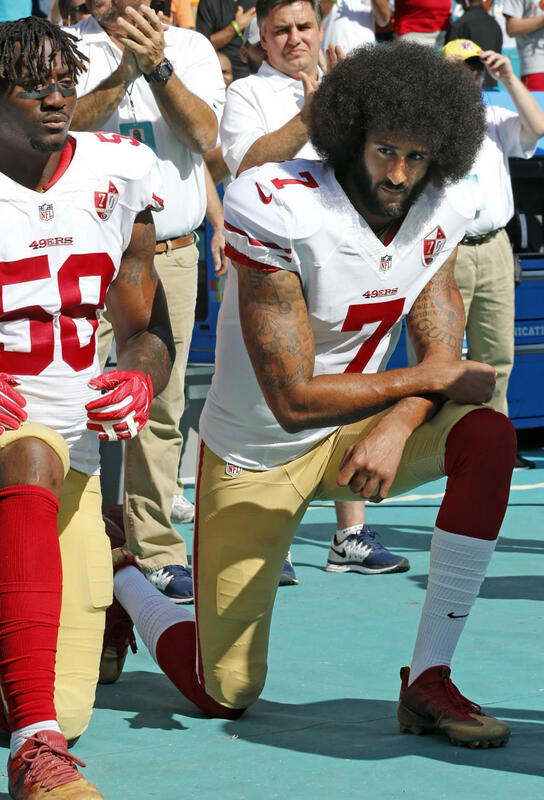 Kaepernick has not played for a team since he left the 49ers in 2016 and became a free agent; last year he filed a grievance with the National Football League, alleging that owners colluded to keep him out of the NFL because of his protests. An arbitrator recently sent the case to trial. Nike’s decision to feature Kaepernick is in keeping with the rebellious image the company has sought in past campaigns. Last month, Nike tweeted an image of Williams with the words, “You can take the superhero out of her costume, but you can never take away her superpowers” after the French tennis federation ruled that she would not be allowed to wear a black catsuit at the French Open next year. The decision also reflects the company’s long-standing tradition of standing behind its athletes. Nike stood by Kobe Bryant after the Lakers star was charged with sexual assault in 2003. Prosecutors later dropped the criminal charges against Bryant and a civil lawsuit was settled out of court in 2005. The Kaepernick decision appears to have initially produced a public relations boost for Nike. A majority of the media sentiment expressed about Nike since the announcement was positive, according to an analysis done Tuesday morning by Apex Marketing Group _ resulting in what the firm estimated to be the equivalent of $19.01 million of paid advertisements taken out in television, radio, web and social media. That compares with $13.76 million worth of neutral sentiment and $10.91 million in negative sentiment, said Eric Smallwood, Apex president. Wall Street was less positive; Nike’s stock closed at $79.60 Tuesday, down 3.2 percent, slightly worse than the market as a whole. Nike’s campaign could pay off in the long term. Boycotts tend to be short-lived and consumers who support brands’ actions typically persist. That can lead to sales growth, Beck said. Corporate brand activism is one way to achieve that loyalty, he said. Millennial consumers, in particular, want brands to be transparent about their stances on social issues, said Powell of NPD Group, whose research found that two-thirds of the people who wear Nike in the U.S. are under 35 years old. And 45 percent of that group is under 25. But in the era of President Trump, the consequences of taking sides can be unpredictable, even for an edgy name like Nike.